The number of blogs online today has increased by 1 billion percent over the past decade, with the number of businesses getting into blogging increasing each day. Surveys indicate that of those utilizing business blogs, 81% of businesses consider their blogs “useful,” “important,” or “critical.” You know my take on business blogging, but what do they really offer the modern thought leader? 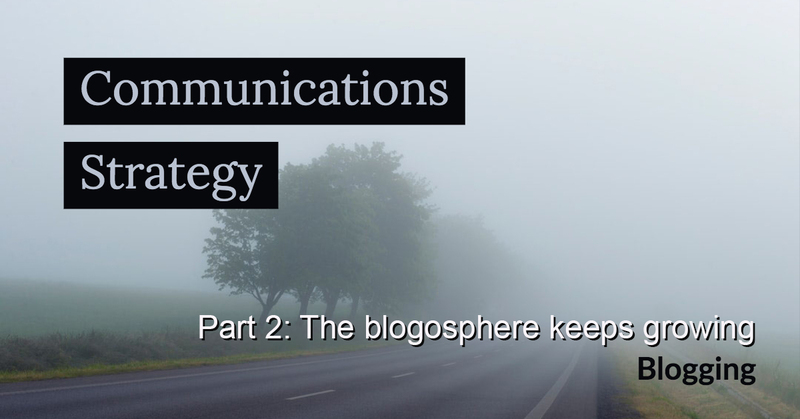 Blogging gives you complete ownership of your thought leadership. There are no gatekeepers when you write in your own blog. No one else filters you or can claim ownership over what you produce. You can say what you want, write what you want how you want to write it, and it will be found under your name and/or associated with your business—within the limits of your corporate policies and brand guidelines, of course. When you can create a reliable and substantial business blog, you have the opportunity to become the resource your network depends upon. People regularly seek out influencers and leaders to help them make sense of complicated issues. Savvy business people are always on the lookout for new ideas they can implement and strategies and tools they can use. Most of us are never done learning. Businesses who blog recognize the areas of value, insight or expertise they can offer to others and then make that thought leadership available. Ideally, every leader should be always on the lookout for information and insight they can incorporate into their lives and businesses, build upon that, and then add even more value into the world with what more they have learned. It is a continuous process with infinite untapped potential. The more you and your business read, write, learn and create, the higher everyone can go. And if you’re writing for your prospects, blogging is a great way to build credibility and followers. Studies indicate that an amazing 81% of U.S. online consumers trust information and advice from blogs. Blogging gives you the opportunity to reach out and connect directly with individuals and businesses you likely could not have connected with otherwise. If done well, blogging can build a following of readers looking to you for insight and perspective. In the financial services world, where I do most of my work, blogging is still relatively new. Bankers are professional risk managers, and there is some risk in throwing your ideas out into the blogosphere. The industry has matured to the point now that companies know how to protect themselves, their brands and executives so we’re seeing more bloggers today. The industry’s trade publishers were some of the first on the blogging bandwagon. Over the years, they have developed some very good bloggers. I’m not talking about online news and headlines. While that’s important, I don’t consider that blogging. A blog advances thought leadership. I see that in the HousingWire’s REwired blog and in the National Mortgage News Voices blog. And I love the work editor-in-chief Jacob Gaffney is doing for brokers, though that may be a blog delivered primarily via email. I also like MReport’s Commentary section and the blog on National Mortgage Professional, both of which carry a good selection of industry commentary from the executives actually working in the business. Tony Garritano does a good job of adding that extra bit to the day’s news in his Industry Scoop. Some of my favorite blogs come from consultancies, the best known of which is probably Rob Chrisman’s daily blog. On the agency side, Brian Rieger at True Impact Communications does a really good job on his blog. Yeah, he competes with me sometimes, but he’s the kind of thought leader I’m proud to work with (and against). A practice of regular blogging offers multiple benefits for businesses aware enough to avail themselves of them. Perhaps the most important benefit is an increase in sales. According to surveys, 61% of U.S. online consumers have made a purchase based on recommendations from a blog. On the B2B side, evidence tells us that B2B marketers who use blogs generate 67% more leads than those that do not. And for our search marketers in the audience, blogging gives your company on average 434% more indexed pages. The benefits are clear, and so are the risks of not blogging. Without a blog, you have fewer avenues for connecting with individuals, less potential to connect with businesses, less of a chance to share your thought leadership and expertise with those wondering what you offer, fewer ways to build upon the information you have already gained from others and one fewer avenue through which you can enhance your reputation. Worst of all, you might be eclipsed by a competitor that does blog. When you can create a reliable and substantial business blog, you have the opportunity to become the resource your network depends upon. You have the ability to proudly display what you offer and your areas of expertise, building your audience and increasing your sales. You can become someone people turn to with questions or when in need of inspiration or guidance. So, are you ready to start? I have a bit more advice for you coming up in the next few posts. Read Part 3 in our Blogging series.